When Final Fantasy XIII-2 launched in Japan earlier this month, it sold only half a million copies on the PS3 in its first week, which isn't near the 1.5 million copies FFXIII moved in its first week in Japan. I say "only" like half a million is something to sneeze at—it's not. And post release, there was the inevitable price drop. I always look at these things as a primo time to buy games without paying through the nose—especially if you are buying the Xbox 360 version. Because holy cow, look at the price difference for the Xbox 360 version! 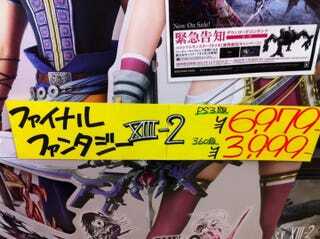 So while a half a million PS3 versions were sold, only ten thousand Xbox 360 versions of FFXIII-2 went on sale. For comparison's sake, three times as many copies of The Elder Scrolls V: Skyrim were sold for the Xbox 360 in Japan (80,000 copies for the PS3). If you want to pick up games cheaply in Japan and don't mind the puzzled look from Japanese friends when you ask for their Gamertag, the Xbox 360 might be a good way to get games on the cheap.